Don't MISS these massive reductions - delay and you will KISS your investment goodbye! Are you looking for a great gift for the perfect woman in your life? Look no further than these special KISS and MISS number plates. K155 and M155 number plates were specially released by DVLA for the gift-giving public. A study found that around 46% of all personalised registrations were bought as presents for loved ones - birthdays, Valentines, even as wedding gifts. You can personalise these reg marks with any three letters following. Why not see if her initials are available? Maybe even her name? And because they are both prefix style number plates they can be fitted to any age car after 1992 and 1994 respectively. Donât see anything you like? Type her name or initials into our search bar at the top of the page to see if there are any other registrations available that will make for a special gift for her. Orders taken on a first-come, first served basis. Subject to availability. Depending on demand, we may even take offers on these crazy prices! 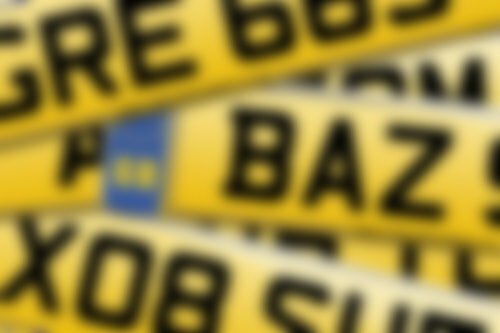 Find the perfect number plate for your name amongst 99 of the UK's most popular male and female first names, and the most popular UK surnames. Build your own new-style registration: as you work your way towards a specific registration, matching plates will be displayed for you. Find a number plate to match the initials in your name. Searching for your initials is a popular way to find a registration.